Don't let the happy faces of the cast of "Spirit of the Glass: The Haunted" fool you. The film promises to be a serious scare-fest for Pinoy filmgoers. As any horror trope anywhere in the world has always banked on, we should never toy with the unknown because it might just come back to haunt you. And if the West has there Ouija boards to break this simple rule, here in the Philippines the Spirit of the Glass has been the staple go to when it comes to contacting the other world. In “Spirit of the Glass 2: The Haunted”, three fashionista friends who are popular on social media attempt to have some offline fun by trying to contact spirits using the age-old Spirit of the Glass game and this opens up to a series of horrific haunting experiences. Bea is a lifestyle editor of a popular magazine, Lisette is an up-and-coming young actress, and Chelsea is a sought-after model. One night, together with their love interests, Enzo, Jag, and Andre summon a trio of vengeful spirits and this triggers a succession of disturbing supernatural events in relation to a crime committed 50 years ago. The spirits haunt the girls and their partners until they are forced to connect with a blind medium named Anita to help the spirits seek justice and eternal peace. The movie is written by Jose Javier Reyes as a nod to the first "Spirit of the Glass" movie which he also directed. The first movie came out in 1994 with an ensemble cast including Rica Peralejo, Marvin Agustin, Drew Arellano, Paolo Contis, Alessandra de Rossi and Dingdong Dantes. 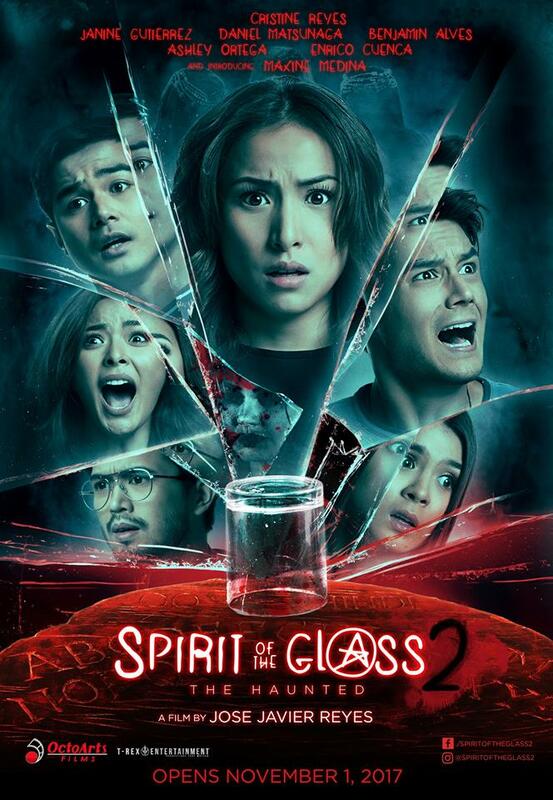 “Spirit of the Glass 2: The Haunted” stars Cristine Reyes, Daniel Matsunaga, Maxine Medina, Benjamin Alves, Ashley Ortega, Enrico Cuenca, Janine Gutierrez, Dominic Roque, and Aaron Villaflor. With fresh new faces and the latest in special effects and filming technology, together with superb storytelling, this latest installment in the horror genre promises to give a new generation of Filipino moviegoers another screamfest full of thrills and chills. The movie produced by Octoarts Films in association with T-Rex Entertainment is set to screen at Philippine cinemas starting November 1.